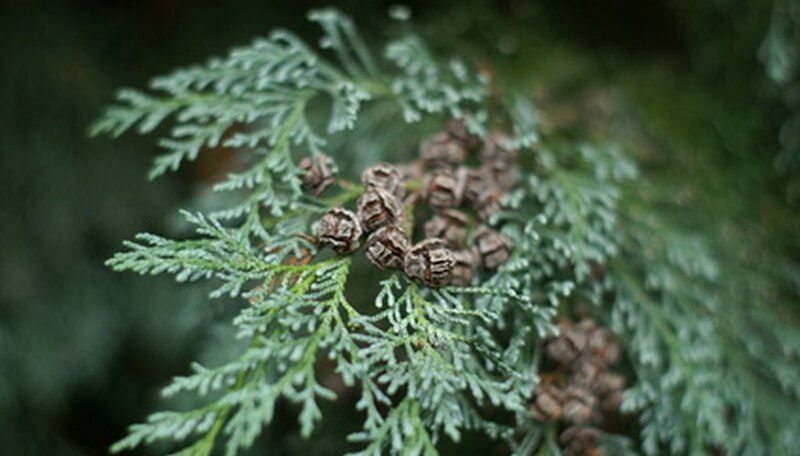 The blue Leyland cypress is a rapidly-growing evergreen that can reach mature heights up to 70 feet. This dense tree grows in a natural pyramidal form and produces bluish-green, feathery foliage. The blue cypress thrives in most soils and is highly drought-tolerant. The tree is resistant to most diseases, but can be affected by canker diseases after long periods of drought. This tolerant tree is easy to care for and requires no pruning for healthy growth. Provide the tree with approximately 1 to 1 1/2 inches of water about once a week during the tree's growing season. Adjust the levels for periods of drought and rainfall. Allow the soil to dry between each irrigation to prevent root rot. Apply a well-balanced, slow-release fertilizer such as a 30-30-30 or 40-40-40 periodically during the growing season. Distribute the feed evenly around the blue cypress. Keep the fertilizer at least 1 foot away from the trunk of the tree. Water the fertilizer thoroughly into the soil. Pull weeds from the planting bed of the blue cypress tree as soon as they appear. Apply a 2 to 3-inch layer of organic mulch around the base of the tree to promote moisture levels and reduce weed invasion. Add mulch throughout the growing season to maintain a consistently even layer. Replace the mulch with fresh mulch each spring. Apply a general fungicidal spray to prevent the potential of fungal diseases in the early spring just before the onset of the growing season. Follow the manufacturer's directions.